Other than situations where an errant suitcase is delivered to a passenger, the airlines do not get involved with shipping bags beyond the airport baggage carousel. For delivery within 40 miles of the airport the cost is $29.95 for the first bag, $39.95 for two bags, and $49.95 for up to 8 bags to the same location. Beyond 40 miles an additional fee applies. Lest you think that this would be a way to avoid paying United's own fees for checked baggage, it won't be. But if you have a United Explorer VISA card like I do, or are a high-status Mileage Plus traveler, or are flying first-class, you don't have to pay to check the bag - you just pay for the delivery service. Airlines are getting heat for adding fees for services previously provided for free, but this is not the same; it's a brand new service that has real value for passengers who are checking luggage. Here are a few situations that occur to me where this would be of great value. You're a business traveler headed to Chicago who has to go directly to an important meeting but you do not want to schlep luggage around all day. You arrange for your bag to go directly to your hotel. Your family of five (and five pieces of luggage) are going on a trip to Disneyworld and the last thing you want to do is ride the car rental shuttle with the Gang of Five and the Gang of Five Suitcases. You arrange for the Gang of Five Suitcases to have their own ride to the hotel where you are staying. You are traveling by yourself to spend a month in Boston. You are not renting a car and you do not have someone to meet you at the airport. The idea of lugging two giant suitcases on the Boston subway system to get from the airport to your lodging doesn't charm you, so you arrange for the bags to be delivered to you after you arrive. If you can afford to pay a little money to make a problem go away, then you should do it, and this service can really make some travel problems go away. I hope the service is so successful that not only United expands it to many other airports, but other carriers copy it. It's an idea whose time has come. The South Coast Railroad Museum (in Goleta, adjacent to Santa Barbara) is sponsoring an excursion on Saturday, 19 January 2013, from Santa Barbara to San Luis Obispo and back. The two cars are the Overland Trail (from Southern Pacific's Overland) and the Acoma (from the Santa Fe's Super Chief). As I write this it appears that seats on the Acoma are sold out, but space remains on the Overland Trail, though it no doubt will sell out soon, too. The South Coast Railroad Museum operates this type of excursion often under the Central Coast Flyer name; two more are on tap for 16 February ("Sweetheart Special") and 23 March. Check out their website for future trips if you would like to coordinate a trip to the area in conjunction with one of these excursions. They also operate the Santa Barbara Vino Train, a round-trip day excursion from Los Angeles to Santa Barbara using the Overland Trail. In case you are not aware, it is this portion of the route between Los Angeles and Seattle that puts the "Coast" in Amtrak's Coast Starlight. 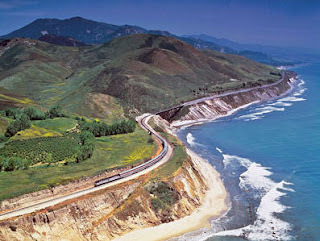 From Santa Barbara to Grover Beach, most of the trackage is in sight of the ocean and includes beautiful vistas you'll never see otherwise, because U.S. 101 runs inland. It's considered one of most scenic train rides in the world.